Looking to build your own custom add-ons for Easy Digital Downloads, WooCommerce, iThemes Exchange, or WP e-Commerce? You're in the right place! 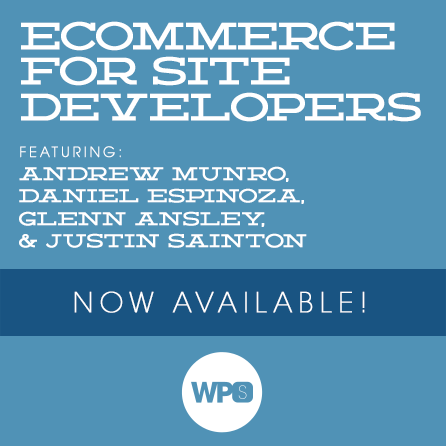 Join Andrew Munro, Daniel Espinoza, Glenn Ansley, and Justin Sainton for a deep dive into building with and building for Easy Digital Downloads, WooCommerce, iThemes Exchange, and WP e-Commerce. By the time the session is over, you'll be ready to build something great! Each of our sessions are digitally broadcast live and feature 3 separate presenters each focusing on a specific aspect of some WordPress topic. Each presenter will have roughly 30-40 minutes allotted for instruction and 15 minutes allotted for Q&A at the end. This means that, typically, the session will run three hours start-to-finish. Andrew Munro (@sumobi_), Daniel Espinoza (@d_espi), Glenn Ansley (@glennansley), and Justin Sainton (@JS_Zao) are here to teach us how to extend and develop alongside three of the most popular WordPress eCommerce platforms: Easy Digital Downloads, WooCommerce, and iThemes Exchange. In each presentation you’ll learn how to write your own add-on for the platform and how to leverage its documentation to tap into the many hooks and internal APIs provided. This session will be broadcast live on April 19, starting at 1pm ET. Follow along as one of the most prolific Easy Digital Downloads (EDD) Add-on authors takes you through his process of building custom plugins for EDD. For this presentation, we will be looking at a real-world need and stepping through everything that needs to happen to make it a useful, working add-on. Exchange is billed as the simplest ecommerce plugin you will ever use. In this session you’ll get to hear directly from one of the project’s lead developers and see for yourself how to build tools that are easy to use and feature rich. Follow along with one of the lead developers of WP eCommerce, the most senior of all the WP-powered eCommerce solutions that is still alive and thriving. Learn how to turn this powerhouse into your own personal workhorse by building things to meet your (or your clients) specific needs. Andrew (aka Sumobi) is an eCommerce-loving support moderator, core developer and plugin developer for Easy Digital Downloads. Having built over 20 custom extensions for EDD, it’s fair to say he knows a thing or two about it. Andrew is currently collaborating with Pippin on AffiliateWP, which (naturally) integrates with EDD. In 15 months Daniel went from zero plugins and no product income to 20 plugins and over $7K per month in sales. In the past year, Daniel leveraged these plugins to pay off all debts and eventually quit his job. He and his family are now nomads, travelling the world as “digital tentmakers”. Glenn creates plugins, bugs, and other random issues for the iThemes support team. He lives outside of Raleigh, NC with his wife and four kids. If he’s not programing or reading, he’s probably changing a diaper or fishing a toy out of someone’s nose. Justin Sainton is the founder of Zao and #BeachPress, a web firm based in Portland, Oregon. As a core contributor to WordPress and a core developer for the WP E-Commerce project, Justin believes passionately in the philosophy of open-source software. Justin also likes long walks on the #BeachPress.